Bloggers! Join our newest event! 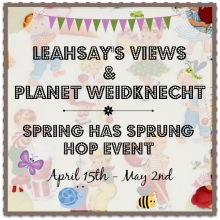 Hosted by: LeahSay's Views and Planet Weidknecht. The event will run April 15th - May 2, 2014. A dedicated giveaway post for this event; beginning on Tuesday, April 15th at 12:01 AM running through Thursday, May 2nd at 11:59 PM. Make sure to set your giveaway forms accordingly; if your giveaway ends early you're losing potential followers. If you have doubts about setting your giveaway form, please ask. Any blog without a post up by 10 AM (SHARP) April 15th. Will be removed from the linky. Once your giveaways been corrected of missing linky, picture or no post at all. It can be added back to the bottom of the link. Sign ups for this event close on Sunday, April 13th.. Please consider joining the Weidknecht Events Facebook Group helping you keep up with the events posting information or any questions you may have. Spring Has Sprung Event Button. Links to the hosts LeahSay's Views and Planet Weidknecht with nofollow links. If you would like to see your company's product featured in this event or a similar event contact me at leahsaysviews at gmail dot com. Also, your email address is **IN the linky** when signing up, because all hop info will be sent via email. HTML code will be sent to the email address you provided in the linky below; check your spam box. Please be kind and share, thank you!